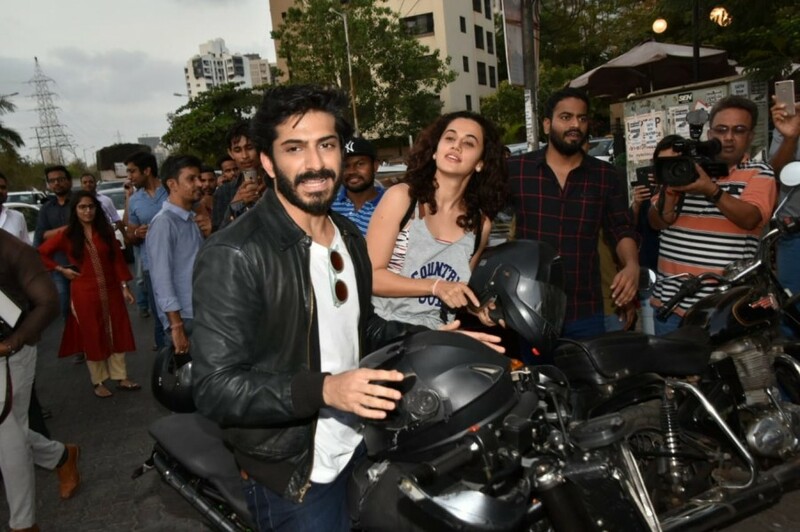 Ahead of the Bhavesh Joshi Superhero's release actors Harshvardhan Kapoor and Taapsee Pannu were spotted on a bike together for Bhavesh Joshi promotions. On Sunday the actors took time from their busy schedule and were seen enjoying a bike ride in the suburbs of Mumbai. Dressed in biker gears, the two stars had quite a blast as the Harshvardhan rode along the roads of Mumbai with an excited Taapsee sitting behind him. Harshvardhan has earlier made impromptu appearances at Deadpool screening and GQ Best Dressed as BJS wearing the mask. The film marks Harshvardhan Kapoor's second outing where he turns social crusader in his fight against corruption as the common man turns Superhero in the vigilante drama. The action-packed trailer which was loved by the audience traces the journey of a group of friends who set out on the path of righteousness. Over a series of thrilling incidents, their life takes a curve, leading a common man to become a Superhero in the form of 'Bhavesh Joshi Superhero'. Presented by Eros International & Phantom, Bhavesh Joshi Superhero is directed by Vikramaditya Motwane starring Harshvardhan Kapoor and is slated to release on 1st June.